Flavor. Few commercially prepared bone broths taste like it was made in your own kitchen. No one in the industry uses a superfood ingredient lineup like ours including kombu, kale, turmeric, Redmond’s Real Salt, and more. The end result is just like homemade – delicious, savory and robust. Sourcing. All ingredients are the best, period. Sustainable/ethically sourced bones, organic vegetables and herbs, targeted anti-inflammatory spices, and love from the land. Nutrition. Crafted and field-tested by a nutritionist to contain optimal health-giving benefits like 10-12 grams of protein per serving, collagen, gelatin, minerals, and electrolytes. Ready to heat-and-serve with robust flavor, clean ingredients, gelatin-rich and nutrient dense - guaranteed. Slow-simmered, minimally processed, and frozen for maximum health benefits. Fresh for 6 months in freezer or 7-10 days in refrigerator once thawed. Perfect for sipping or holiday cooking! Enjoy plain or boosted with healthy fat (grass-fed butter or Bulletproof Brain Octane Oil our favorites), Redmond's Real Salt, and your favorite spices. Ingredients: filtered water, 100% pastured free-range chicken bones, organic chicken feet, onion, organic carrot, organic celery, organic kale, unfiltered apple cider vinegar, organic parsley, organic whole clove garlic, Redmond's Real Salt, kombu, cumin, mushroom extract (shitake mushrooms, button mushrooms, rosemary extract), turmeric root, coriander, cayenne pepper, thyme, rosemary extract. 20 oz in each pour spout pouch. While this product is pricey, it is exactly as described: very flavorful. 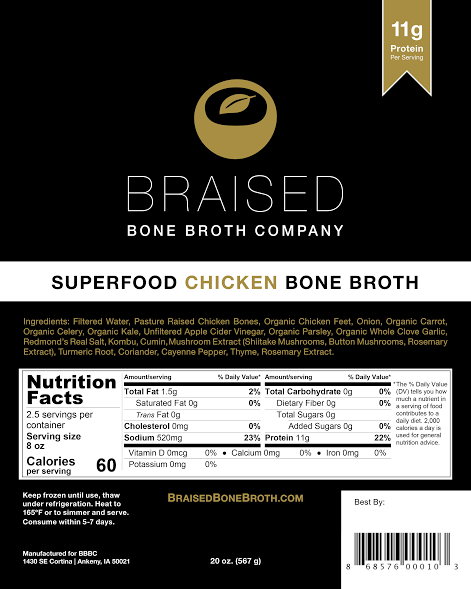 I've never been one to drink bone broth but this is so good, I drank a cup of it - amazingly good. I use it to flavor my rice and for its health benefits. If feeling too lazy to cook, this is a great, healthful option. Get plenty...it goes quickly! Fresh for 6 months in freezer or 7-10 days in refrigerator once thawed.